I have no regerts. Can you say the same?? LOL! Great article! Would you ever have a tattoo? Or do you have one already? I’ve been toying with the idea for a while but I think I just have to accept that I’m too much of a wuss. It’s not the pain that bothers me (I’ve had a few ‘incidents’ that were probably much more painful than getting a tattoo, and have the scars to prove it). The reason behind my reticence is the fear of making the wrong choice. And then being stuck with something on my skin that is permanent and eventually just annoys me. 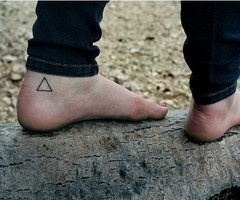 If I was to walk into a tattoo parlour tomorrow, I would ask for something similar to this. See I’m not exactly ‘out there’ am I? But still, I’m holding back. Perhaps it’s threads such as these on Buzzfeed that spark this fear. 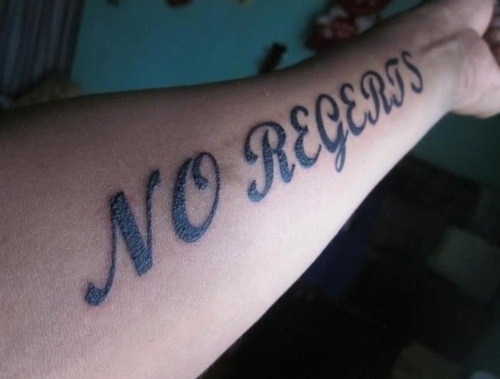 ‘No Regerts’, though. ← So We’ve Been Dating For A Week…And I Got Your Face Inked On Me!